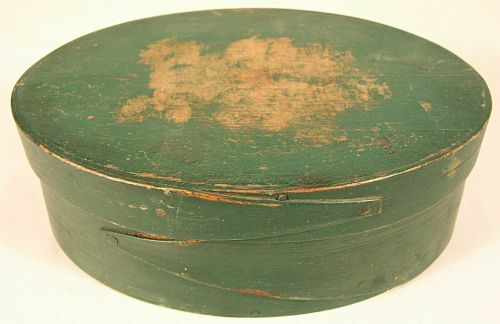 Green painted oval pantry box often referred to as Harvard Shaker type. Lapped construction with copper tacks. Wonderful original condition with no damage and only minor wear to the top. Dimensions: Measures 6 1/2" across the top X 4 3/4" Bottom measures 6 1/4" X 4 1/2"